As part of the SHAC campaign 70 people turned out for a demonstration and march against Novartis’ headquarters (an animal research centre and top HLS target) in Horsham on Saturday 31st October. Up until 2pm the day before Sussex Action For Animals (SAFA) were not even sure that the demonstration would be able to take place. Earlier in the month Novartis had attempted to get an interim injunction using the notoriously repressive solicitor Timothy Lawson-Cruttenden, known for numerous HLS injunctions and failing to seize a protestor’s assets amongst other civil liberties issues. 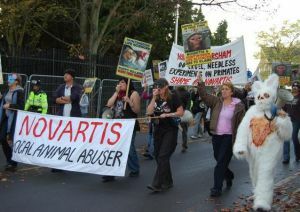 Novartis were seeking to prevent banners on the demonstration from bearing the words “Novartis”, or carry posters showing images of animal suffering. They didn’t want protesters to be able to wear masks or costumes; in particular blood stained lab coats. They did also mention something about fireworks! However, despite the best efforts to dredge up any dirt they could to support their application, the judge found in favour of the campaigners.